The LM35 is a common semiconductor temperature sensor. It produces an output voltage between -0.55 to 1.5 Volts, proportional to its temperature. This article shows how the LM35 can be simulated using a SPICE model, which can be configured for a fixed temperature, or swept over a range of temperatures. The LM35 is an integrated circuit that provides a linear output proportional to temperature, with a sensitivity of 10mV per degree Celsius. It does not require any external calibration or trimming and provides typical accuracies of +/- 0.25 degrees at room temperature, and +/- 0.75 degrees over a full -55 to +150 degrees C temperature range. It is available in a number of different packages, e.g. TO-46, TO-92, 8-lead surface mount SO, and TO-220. To simulate this device in SPICE, such that it produces the normally expected voltage output at any given temperature, we require a linear temperature controlled element. 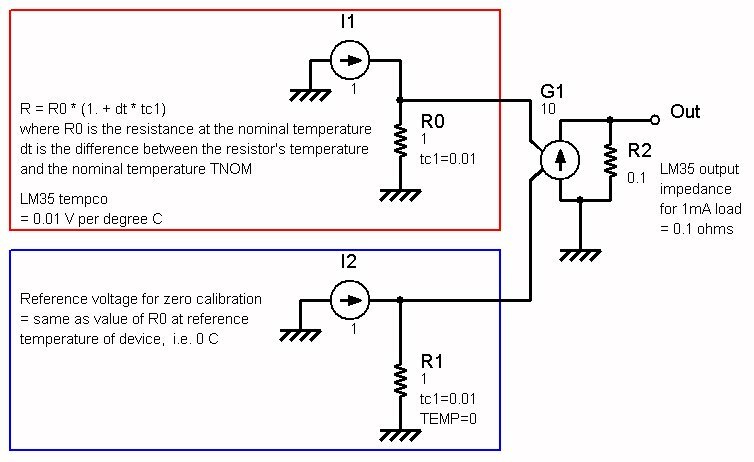 There is an option for the resistor model to specify a temperature coefficient, or a polynomial series of temperature coefficients. For a linear dependence, we only need one coefficient and the others may be omitted (defaulting to zero). dt is the difference between the resistor's temperature and the nominal temperature, and tc1 is the temperature coefficient in ohms per degree. We need an output voltage that goes to zero at the temperature that the TC35 is calibrated to give zero output for, so a second current source and resistor are used to generate a voltage corresponding to a fixed temperature at zero C.
A voltage-controlled current source G1 is used to subtract the reference voltage from the temperature dependent voltage to obtain a temperature dependent output that is zero at the reference temperature for the LM35. The gain of G1 and its shunt resistor are chosen to give a voltage gain of 1 and an output impedance of 0.1 ohms to match the dynamic impedance of the LM35 for a 1mA load. This simulation uses the built-in global temperature value of SPICE that is typically used to either specify the operating temperature of a circuit, or is swept to measure circuit characteristics over a temperature range. To demonstrate the model, which is given below as a SPICE netlist, the LM35 model is packaged as a subcircuit, and invoked as "X1 1 LM35" which simply gives us one node where the output voltage appears. Note that there is no simulation of the LM35 power supply, or any detail of the internal circuit; this is purely a behavioural model. Also note that for the full sub-zero temperature range to be covered, a pull-down resistor is required; for details please consult the manufacturer's data sheet. If you need to simulate the thermal time-constant of the device, there doesn't seem to be a way for SPICE to set an operating temperature and follow a time-dependent response simultaneously, so this would not work in the model I have given. As an alternative, you could simulate the output of a sensor as a transient model, using a stepped voltage source to switch between the voltages at the temperatures of interest, followed by an RC network with the appropriate time constant. For example, for a thermal time constant of 15 seconds, which you would get with a TO-92 package in still air, you could use a 0.1 ohm resistor in series with a 150 Farad capacitor, which will give you the time constant with the dynamic output resistance of the LM35. If using a 150 Farad value for simulation (which is hardly practical) does not appeal to you, or perhaps the shunt capacitance could be a problem being connected to subsequent circuitry, you could use a time constant stage with say a 1Meg resistor and a 15 uF capacitor, followed by a voltage-controlled current source with a gain of 10 and a shunt resistor of 0.1 ohms to model the dynamic output resistance of the LM35.